Peter Dermot Doherty (5 June 1913 – 6 April 1990) was a Northern Ireland international footballer and manager who played for several clubs, including Manchester City and Doncaster Rovers. An inside left, he was one of the top players of his time, winning a league title with Manchester City, an F.A. Cup final with Derby County in which he scored, and gained 16 caps for Ireland. His later career saw him as the central figure as player and manager during Doncaster Rovers most successful era. At the same time he managed Northern Ireland, leading them to their most successful achievement reaching the quarter finals of the World Cup in 1958. He was in the first group of 22 players to be inducted into the English Football Players Hall of Fame. A plaque marks the birthplace of Doherty in Magherafelt. 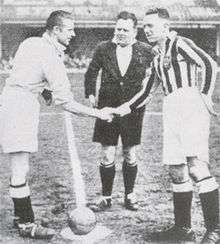 Doherty (left), in his Manchester City days, shaking hands with Jimmy Hampson, of his first club, Blackpool, in the late 1930s. The two were former teammates at Blackpool. Born in Magherafelt, County Londonderry, Doherty began his career with Glentoran in the Irish League. After helping Glentoran to the 1933 Irish Cup, early in the 1933–34 season Doherty joined English club Blackpool, at the age of 19. He joined Manchester City on 19 February 1936 for a then-club record of £10,000. Blackpool needed the money urgently, and Doherty was summoned from his lunch to report to Bloomfield Road. The Irishman tried hard to persuade Blackpool directors that he did not wish to leave the club, for he was due to marry a local girl and had just bought a new house in the town. The fee was an exceptionally high transfer fee for the period; it came within £1,000 of the British record. Doherty's Manchester City debut, against Preston North End, was not a successful one. Tightly man-marked by Bill Shankly throughout, he failed to make an impact, leading to one catcall from the crowd of "Ten thousand pounds? More like ten thousand cigarette cards". Doherty later described the remainder of his first Manchester City season as "uneventful", but his second was to be anything but. Manchester City started the 1936–37 season poorly, and were in the bottom half of the table until December. Occasional big wins, including a 6–2 defeat of West Bromwich Albion and a 4–1 defeat of Everton, were mixed with extended barren runs; at one point the club gained just one win in twelve matches. However, Doherty was scoring goals regularly. A goal in a 5–3 Christmas day loss to Grimsby Town was his twelfth of the season. Christmas proved to be a turning point for the club, as a win against Middlesbrough the following day was the start of a long unbeaten run. By April, Manchester City were second in the table, and faced a fixture against Arsenal, league leaders and the dominant club of the period. Doherty scored the first goal in a 2–0 win, and City reached the top of the table. The unbeaten run continued until the end of the season, and City secured their first league championship with a 4–1 win over Sheffield Wednesday. Doherty, with 30 league goals, was the club's leading scorer, helped by a run of eleven goals in seven games as the season drew to a close. Doherty scored 79 goals in 130 appearances during his time at Maine Road. During the Second World War years of 1939–1945, Doherty served in the RAF. He remained registered as a Manchester City player, scoring 60 goals in 89 wartime matches, though wartime games are not generally included in official records. He also guested for numerous clubs across the country: Port Vale, Blackburn Rovers, Derby County, Birmingham, Brentford, Grimsby Town, Lincoln City, Liverpool, Manchester United, West Bromwich Albion and Walsall. 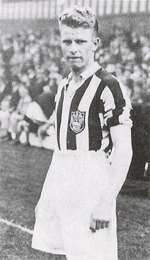 During a guest appearance for Port Vale in 1945, he famously went to take a penalty but instead of shooting he laid it off to a team mate who scored. After the conclusion of the war, he transferred to Derby County, with whom he won the FA Cup, scoring a goal in the final itself. He also went on to play for Huddersfield Town, scoring 33 goals in 83 league appearances. He made his final move to Doncaster in 1949, where he assumed the role of player-manager. He later became manager of Northern Ireland (1951–1962), for whom he had 16 caps as a player. He led the country to the 1958 World Cup, reaching the quarter-finals. He also managed Bristol City. His coaching techniques were revolutionary at the time. He emphasised ball practice and instead of endless laps of the pitch, Doherty suggested volley-ball, "to promote jumping, timing and judgement"; basket-ball, "to encourage split-second decision-making and finding space"; and walking football, "to build up calf muscles". Later life saw him become a scout for Liverpool, helping to unearth such talents as Kevin Keegan. Doherty won a league championship medal with Manchester City in 1937 and a cup winner's medal with Derby in the 1946 FA Cup Final. He was inducted into the English Football Hall of Fame in 2002. 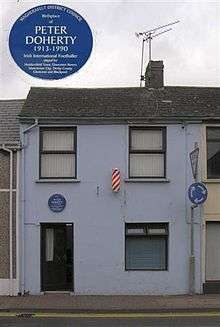 Following his death in 1990, there is a plaque to mark his birthplace in Magherafelt. It can be found at what is now a barber shop. 1 2 Ward, Andrew (1984). The Manchester City Story. Derby: Breedon. p. 37. ISBN 0-907969-05-4. 1 2 Clayton, David (2002). Everything under the blue moon: the complete book of Manchester City FC – and more!. Edinburgh: Mainstream Publishing. p. 69. ISBN 1-84018-687-9. ↑ Gillatt, Peter (30 November 2009). Blackpool FC on This Day: History, Facts and Figures from Every Day of the Year. Pitch Publishing. ISBN 1-905411-50-2. 1 2 James, Gary (2006). Manchester City – The Complete Record. Derby: Breedon. p. 350. ISBN 1-85983-512-0. ↑ Kent, Jeff (1996). Port Vale Personalities. Witan Books. p. 86. ISBN 0-9529152-0-0. 1 2 Penney, Ian (1995). The Maine Road Encyclopedia. Edinburgh: Mainstream. ISBN 1-85158-710-1. ↑ Shackleton, Len (2000). Return of the Clown Prince. A Personal, Retrospective Anthology. GHKN Publishing. ISBN 978-0-9538244-0-3. 1 2 "Football Hall of Fame - Peter Doherty". Retrieved 10 July 2011. ↑ "Peter Doherty". national-football-teams.com. Retrieved 7 August 2015.